- We believe that dealing with insurance should bring a smile to your face - Kunde, a Boston Consulting Group (BCG) alumnus, told me. 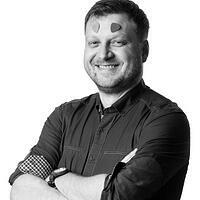 He thinks that Friendsurance, his brainchild inspired by Facebook, might do just that. - When we launched our peer-to-peer insurance model in 2010, it was unique. Since then, more than 25 copycats have emerged across the world - Kunde told me. At BCG, he advised on consumer goods and insurance. At Rocket Internet, Kunde headed a travel startup. He left to conquer the digital insurance space. As one of two managing directors of Friendsurance, Tim Kunde is responsible for marketing, business development, sales, IT, product, customer support, and CRM. As of today, the company has 100 employees, serves over 100,000 customers, and keeps innovating. In 2017 Friendsurance entered a new segment with digital bancassurance. Early this year, the Berlin-based company announced a partnership with Deutsche Bank, the first such example of collaboration with the “old” banking industry. - Thanks to our cooperation with Deutsche Bank, 5% of the bank's online users will also use our integrated insurance platform - that is the plan Kunde envisioned for the year 2020. The basic idea of P2P insurance is simple: customers with the same type of insurance (say private liability or car insurance) can create kind of a group on the Friendsurance platform. They set up a shared pool, subtracted from their premiums. The pool is used to settle minor claims. Any money left is sent back to the customers, or - a better scenario - if no claims are made in a given year, the customers receive a pre-agreed cashback. In the German market, Friendsurance currently operates as an independent insurance broker with more than 70 domestic insurance partners, including AXA. The company gets money from insurance companies for serving customers and looking after them. The claims-free cashback is available with a range of retail products, such as car insurance, home insurance, legal expenses, and private liability insurance. In 2016 Friendsurance raised over $15m in Series B funding. The round was led by Horizons Ventures. I talked to Tim Kunde, founder and managing director of Friendsurance, to learn what his company is planning to do next. Tomasz Grynkiewicz, Netguru: What are the most critical features and values that made Friendsurance stand out from the fintech crowd? 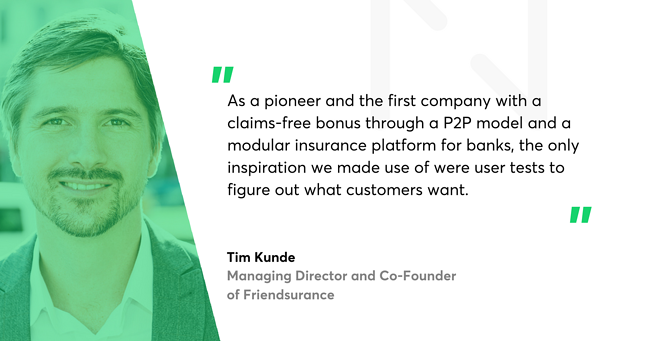 Tim Kunde, Friendsurance: We’re the pioneer of peer-to-peer insurances. And we’re still pioneering the industry, lately with our new bancassurance platform. This pioneering spirit is part of our DNA and always pushes us to go further and to think ahead. You’ve recently partnered up with Deutsche Bank. How will that kind of partnership play out for Friendsurance? How many alliances are you involved in as of today? Thanks to our cooperation with Deutsche Bank, 5% of the bank’s online users will also use our integrated insurance platform. Besides Deutsche Bank, we cooperate with several fintech companies: Aboalarm, Fino, Savedroid and Bonify. In the future, we want to offer our bancassurance platform to more private bank customers and partner with other banks, as well. These partnerships allow us to reach a broader customer base, to which we can offer our customer-friendly insurance solutions. What feedback are you getting from your users? They love the cashback bonus they receive if their group remains claims-free. They love our dashboard, which replaces insurance folders and provides an excellent overview of all relevant insurance data. And they love our Friendsurance app, which makes it possible to get these valuable pieces of information anywhere, anytime. European fintech companies are starting to challenge overseas markets. What is Friendsurance’s approach? When we launched our peer-to-peer insurance model in 2010, it was utterly unique. Since then, more than 25 copycats have emerged across the world, and a new segment solely for peer-to-peer insurance has been established with Friendsurance as the segment leader. We expect that peer-to-peer insurance will become a market standard in the long term. We have international ambitions and a model that can be applied in any market. In 2016, we announced our expansion to Australia. Besides our P2P model, our digital bancassurance platform also can be transferred to other markets. We are checking expansion possibilities for both businesses, but don’t have concrete plans, yet. What are the essential values that fuel your product’s growth? We believe that dealing with insurance should bring a smile to your face. This vision encourages all of us to bring additional value to our products and make them as convenient as possible. A good example is our claims-free bonus. Thanks to the P2P approach we can offer our customers a yearly cashback up to 40% of their insurance premiums if their group remains claims-free. New contracts will already have the Friendsurance concept built in, enabling customers to receive a yearly cashback. Moreover, the claims-free bonus can also very easily be added to existing contracts, creating the most convenient way of saving insurance premiums – without any change in coverage, price or provider. What about internal routines that are essential for the development of Friendsurance? We have various internal routines which are essential for our teambuilding and the employees' development. For example, our “all-hands” is a weekly meeting including the whole company with the goal to keep everybody updated on what happens in different departments. Another example is our continuous evaluation program, which takes place twice a year and is a detailed feedback round. We make sure all employees are satisfied with their job and supported the way they need it. What are the major challenges in the industry that could impact Friendsurance’s vision? The industry is fast-moving. Therefore, the challenge is to keep up with current developments. By entering a new business segment with digital bancassurance in 2017, we adapted our digital insurance platform to the customers' demands for one place for all finances and integrated it into their online banking. Doing both our well-established peer-to-peer (P2P) insurance business and our new bancassurance business is not easy. But digital bancassurance is a logical advancement of our P2P business, and both segments profit from each other. And I believe this is a challenge we can handle. What about the new legal changes coming up in the EU market? The PSD2 directive is an excellent opportunity to offer exciting solutions to the customer with real added value. We welcome regulations like this as they focus on the customers’ needs and demands. In Germany, we’re the only P2P player that gives customers a yearly cashback if no claims happened. Also, regarding the bancassurance business, no provider built his kind of integrated platform in Germany so far. To whom would you tip your hat? As a pioneer and the first company with a claims-free bonus through a P2P model and a modular insurance platform for banks, the only inspiration we made use of were user tests to figure out what customers want. But, of course, there are many fintech players out there offering a simple service with sophisticated technology; we’d tip our hat to them. Our cooperation partners such as Aboalarm, Fino, Savedroid and Bonify are great examples of valuable fintechs with innovative and customer-centric business models. What they have in common with us is a pioneering spirit and an agile way of working.